Available for 200 Ficha-prêmio da CervaFests from Bebel Trocarrápida or Blix Consertatreco during Brewfest. I don't quite understand, why Blizzard did not decide to make this Pony Keg Pony like the Escudeiro de Guilda or Arauto da Guilda, they both have a cooldown on summoning and a limited lifetime once summoned. 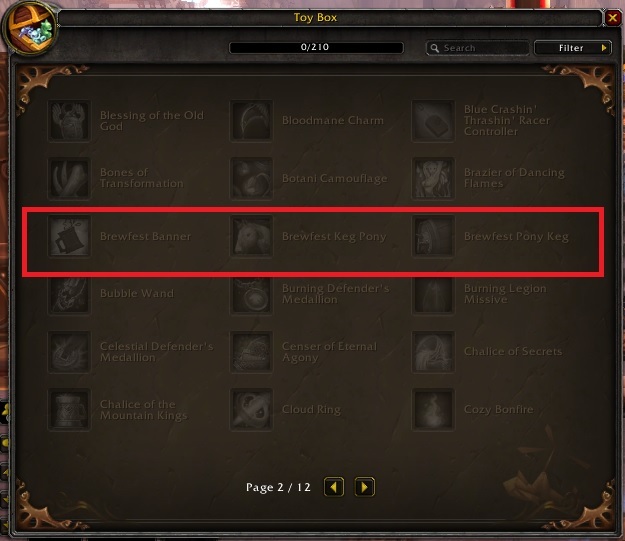 I really hope they retro-fix that to allow us to learn how to summon it, i. e. not wasting a bag space on this thing. It takes 5 Cerveja da CervaFest to get you completely smashed. I did it for the science! ... hic! Now some coffee, pleashe? This little guy is considered a non-combat pet however it will not stay out permanently as the description says it only lasts three minutes and I can confirm that the Biscoito de Ajudante do Jeito Antigo do Papa Hummel do in fact work for its duration. This 'pet' makes the Barrica de Chopp da CervaFest completely obsolete, except for the separate cooldowns. It has all the same effects: right-click gives unlimited Cerveja da CervaFest for 3 minutes, until the 30 minute c/d kicks in. Much to my surprise this item is eligible to be used with Espelho Mágico de Ajudante and if you use it with Chifre de Bebida Vraikal, you can enjoy 10 minutes of being a semi-big Brewfest pony. The counterpart of the Barrica de Chopp da CervaFest. I prefer this one because it follows you on your travels! Also, just with the Barrica de Chopp da CervaFest, your party members can click on it for beer as well. If you want to see it in action before dropping 200x Ficha-prêmio da CervaFest on it, I made a quick video showcasing it. Pônei de Barrica da CervaFest is one of seven unlimited-use drinking items available in game. Pônei de Barrica da CervaFest is sold by Brewfest vendors for 200 Ficha-prêmio da CervaFest during Brewfest. Última Caneca de Lao-Chin - a quest reward from Barris rolantes não criam limo in Monte Kun-Lai. Cerveja de Jin Barril Quente - a quest reward from Hibernação forçada in Monte Kun-Lai. 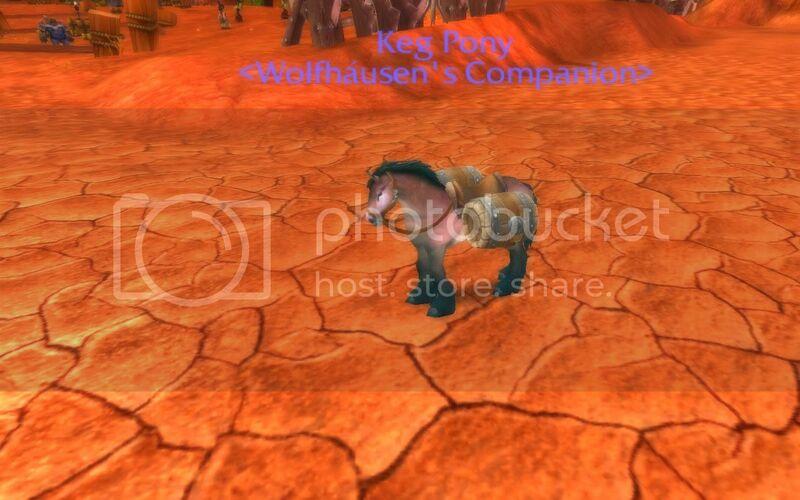 Kit de Cervejaria Ôgrica - a guaranteed drop from Pisoteador Kreego, a rare mob found in Gorgrond (location: 38.2, 66.2). Barril Misterioso - a quest reward from Faxina na casa (A) / Não no seu exército (H) in Agulhas de Arak. Barrica de Chopp da CervaFest - sold by Brewfest vendors for 100 Ficha-prêmio da CervaFest during Brewfest. Mochila de Cerveja Pandarênica - sold by Brewfest vendors for 100 Ficha-prêmio da CervaFest during Brewfest. Recompensa da Colheita (creates Pão da Colheita) - mailed to players after completing Homenagem a um herói (A) / Homenagem a um herói (H) during the Harvest Festival. Fronde Perpétua de Subesporo (creates Vagem de Subesporo) - item is now unobtainable. Restos Perpétuos - contained in Coisas do Nomi which is a quest reward from Em Sinal de Agradecimento. Broto Bacana do Ba'ruun - a guaranteed drop from Ba'ruun, a rare mob found in Vale da Lua Negra (location: 53, 16). Almoço de Talador Gostoso - contained in Lancheira do Encarregado, a treasure found in Talador (location: 57.39, 28.66). Chá de Cogumelo de Stygana sem Fundo - contained in Esconderijo de Cogumelos dos Olhos Sangrentos, a treasure found in Selva de Tanaan (cave entrance: 44.6, 77.5 / treasure location: 49.9, 76.8).